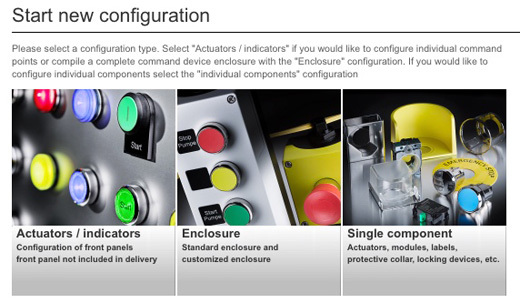 To create a configured enclosure you select the required items in a simple step by step process. When personalising actuators and indicators you have the option to select from a range of standard text or symbols, or adding your own specific content onto the device. Once your configuration is complete, the tool will give your item a unique CIN number. When you are looking to buy, simply include your CIN number when placing your order with LC Automation. You will also be able to use the CIN number to easily reorder the configured product if required in future. It couldn't be more simple to create a unique command enclosure or personalised actuators and indicators. 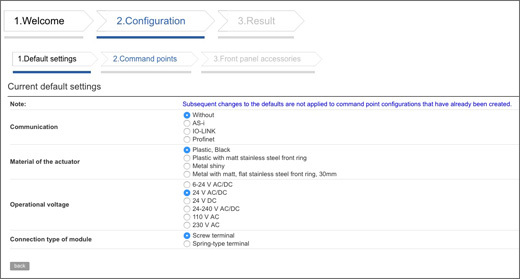 Click http://www.siemens.com/sirius-act/configurator to start the Sirius ACT Configuration Tool (Note: you will probably need to change the language to English - just click Sprache on the top right of the page). If you would like more information on Siemens Sirius ACT pushbuttons and command devices, please don't hesitate to call LC Automation on 01254 685900. Our team of Technical Support Engineers and Field Sales Engineers will be happy to advise you on the correct configuration for your specific application.